3D-Visualization and gaming has come a long way since just two decades ago, when implementations required a lot of overwork, including third-party plug-ins, and in some cases also required capturing of motion graphics for commercial 3D gaming. What are Three.js and Babylon.js? We require two functions–init() and animate(). The init() function creates and sets the position of the camera, creates a cubic geometrical shape, defines the material of the mesh that the shape would be composed of, adds the shape and the mesh onto the scene, and renders the entire scene on a canvas element. 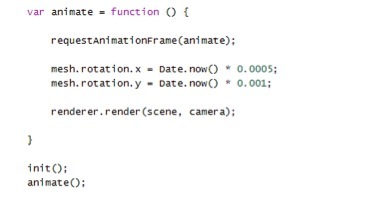 There are multiple types of camera classes provided by Three.js, out of which THREE.PerspectiveCamera is used for a perspective view of the scene. The scene can be added with a mesh (where mesh is composed of a geometrical shape and the colour, or texture, or image that defines how the shape would look), which is implemented by using the THREE.MeshBasicMaterial class. Again, Three.js provides a vast collection of classes of material that can be applied to different geometrical shapes. The most important aspect is the rendering of the objects that makes WebGL with Three.js or Babylon.js easy to work with. Three.js provides a class THREE.CanvasRenderer that renders the objects automatically on the HTML5 canvas element. This provides a very graceful fallback in case WebGL (which is dependent on the compatibility of the latest browsers) is not compatible with the browser being used at client end. The animating Cube example can be viewed on the demo link. I have made two custom meshes properly using xhtml code, one is garment(T-Shirt) and another is Model(Human Body), but i am trying to simulate Garment with Model means i have added physics engine and collision. I am unable to add imposter and joints beacuse of this simulation between Garment(Cloth) and Model(Human Body).I am too much stuck and waiting your reply.